“Being that we’re in Silicon Valley, we are surrounded by innovators who create or want to create technology that can change the world, so The Tech is moving towards becoming a resource for those innovators and others around the world, ” said Maryanne Mwangi, ’11 Psychology. As assistant project manager for the exhibits team, Mwangi provides support during the development and creation of the museum’s experiences. She is there every step of the way from brainstorming and initiation to maintaining a schedule, managing a budget and communicating with other teams during the set-up. Mwangi assisted with the brand-new experience Social Robots, which opened July 1. Visitors have the opportunity to design and build their own working robots. She describes the “a-ha moment” when people connect the different pieces together, and their robots come alive. User experience is an important priority in both technology and museums, especially for a technology and science museum that is creating more interactive, hands-on experiences like Social Robots. Mwangi’s psychology education gave her a foundation for brainstorming and collaborating with her team on exhibits. Gladys Rodriguez, ’13 Hospitality, Tourism and Event Management, remembers childhood trips from her hometown of Watsonville to the Santa Cruz Beach Boardwalk. Little did she know that she would grow up to help run the same Friday Night Bands on the Beach concert series she enjoyed when she was younger. “I have pictures of me on rides when I was two years old, and looking back now, I never thought I would have the opportunity to work at the Boardwalk, and I never thought I would be helping manage such big events,” she said. A recent SJSU graduate, Rodriguez is a promotions assistant, working closely with the director of promotions and entertainment. Her schedule varies depending on the festivities happening that week. On Mondays, she focuses on office tasks, such as contacting vendors for an upcoming extreme sports expo. Wednesdays consist of monitoring activity and attendance during Movies on the Beach. The focus of Fridays is supporting the weekly evening concert, from the beginning of the day when she’s picking up the band until the end of the show. Rodriguez was working at the Student Union’s information center when lecturer Rich Larson stopped by to tell her about an open position at the Boardwalk. Larson is program director of the SJSU Special Event Management Team. Rodriguez was a student manager at the 2013 AT&T Pebble Beach National Pro-Am, participating in Larson’s program. Working at the golf tournament in addition to other internships and her event management education prepared her well for her current position. On a breezy summer evening, fans decked out in green, gold and white head into O.Co Coliseum to root, root, root for the home team. As streams of people make their way through Gate D, they pass by the Oakland A’s Kids Club booth. There, Ellison DeCastro, ’11 Hospitality, Tourism and Event Management, talks with the youngsters, who stop by to receive the latest stamp in their passport books. They’re working their way up to earn bigger prizes. In the meantime, with a spin of the wheel, will they win a pencil, key chain or temporary tattoo? As attendees settle into their seats less than 15 minutes before the first pitch, Stomper the elephant mascot and the Oakland A’s promotions crew make their way around the warning track. The entourage includes Marcus Gonzalez, ’10 Radio-Television-Film, who throws beaded necklaces to the excited crowd along the way. As members of the A’s promotions crew, DeCastro and Gonzalez push the A’s brand and team at Bay Area community events as well as within the concrete walls of the coliseum. “If it’s a close game, we come out here to cheer, interact with the fans, throw beads or kind of get them riled up a bit, get them excited, pumped up, especially if they’re quiet,” Gonzalez said. Before the game begins and while it is in session, DeCastro and Gonzalez search for people to participate in promotions and contests between innings. This involves a lot of chatting with fans to find the right candidates. 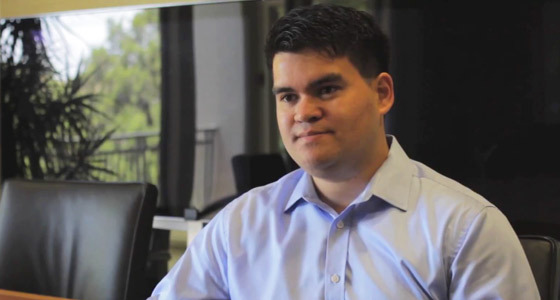 It may be hard to believe now, but Gonzalez was shy when he started attending SJSU. Then he began to break out of his shell when he became involved with the campus radio station KSJS. Being a deejay and representing the station at events turned out to be great practice for his current job. Both Gonzalez and DeCastro earned spots on the SJSU/Pebble Beach Special Event Management Team, which gives students the opportunity to manage hospitality workers during the AT&T Pebble Beach National Pro-Am. One of the perks of living in the Bay Area is the many professional sports teams, each with promotions crews and other opportunities for people interested in sports-related careers. For a lifelong A’s fan like DeCastro, he is exactly where he wants to be. “It’s pretty much a kid’s dream to work for his favorite baseball team,” he said. Spartans at Work: At the San Jose Rep, "I Get to Work With Kids and See Their Imagination Grow"
Where will an SJSU degree take you? How about helping you develop your career, while you develop others? 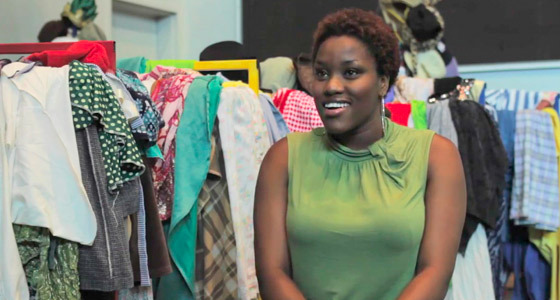 As an outreach assistant, Oluchi Nwokocha, ’11 Theatre Arts and African-American Studies, helped the San Jose Repertory Theatre make connections with the diverse community that it serves. Besides responsibilities such as writing grant proposals, designing brochures or supporting various programs, Nwokocha interacted with kids and teenagers through the Creative Dramatics Summer Workshops. This summer camp teaches young participants about improvisation and developing a story for a play, culminating in a performance for family and friends. What started as a 2011 internship for the fresh Spartan graduate became a job and a chance to learn about behind-the-scenes work of running a theater, a complement to her acting skills. Observing actors on stage performing their craft was an added bonus. In a role that is all about making connections, Nwokocha heard about this opportunity at the Rep, thanks to an announcement from one of her SJSU professors. Her boss at the Rep provided feedback when she applied for graduate school, which is where Nwokocha is heading to this fall to earn a master of fine art in theatre from the University of Florida. 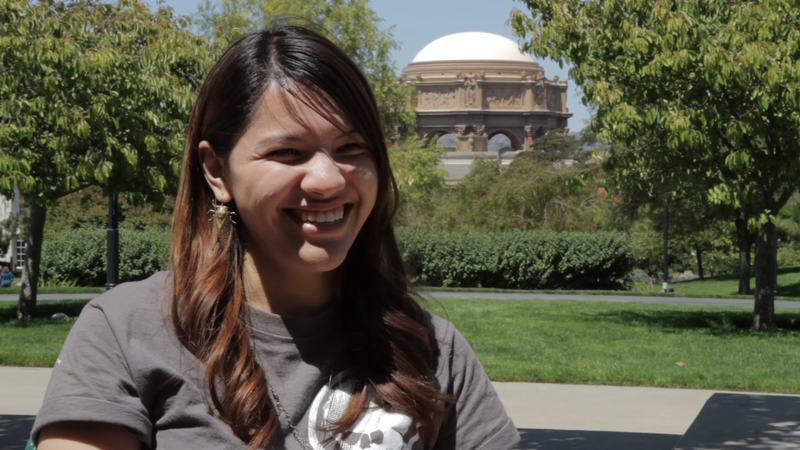 Jeanie Chang, ’13 Animation/Illustration, spent the summer working as a concept artist with the Lucasfilm University Jedi Academy Summer Internship Program at the Letterman Digital Arts Center in San Francisco (Dillon Adams photo). For Jeanie Chang, ’13 Animation/Illustration, being “on the job” means having the right attitude and work ethic. “You can’t just create a pretty picture, it has to serve a purpose,” she said. Chang spent the summer working as a concept artist for LucasArts, a top developer of interactive video games, at the 12-week Lucasfilm University Jedi Academy Summer Internship Program at the Letterman Digital Arts Center in San Francisco. Her team recently released a trailer for the third-person action video game Star Wars 1313, due out next year. 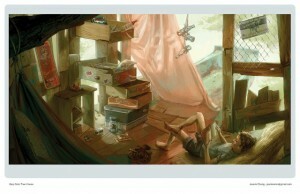 “As a concept artist, I worked on coming up with ideas and the storytelling for the environment,” meaning the scenery behind the characters, Chang said. In addition to visually representing ideas, Chang worked on reference-gathering and organizing to help the other artists on the team. Jeanie Chang’s skills building an environment, or background, are clear in this example from her porfolio at http://jeaniechang.blogspot.com/. The summer program provided her with many learning opportunities, all of which have helped her to “know better what to expect” in the gaming industry. The most rewarding aspect was learning she has much to offer. Other rewarding opportunities for Change included seeing behind-the-scenes artwork and working with her concept artist mentors, three SJSU alums. What’s Chang’s advice to those thinking about taking an internship? “This is your time to really focus on learning and take advantage of all of the opportunities,” she said. 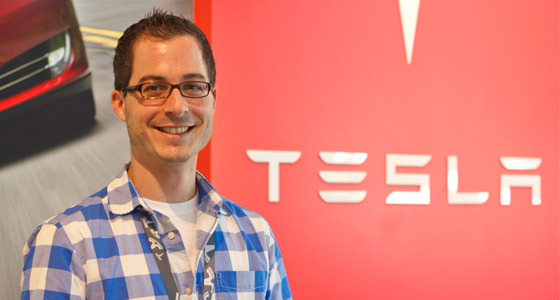 Spartans at Work: At Tesla, "It's Just a Great Work Environment to Learn and to Challenge Yourself"
When considering U.S. exchange programs, Canadian Marc Gagnon had one ultimate goal: to eventually work for electric car company Tesla Motors. SJSU’s location made the school an ideal option. Gagnon took engineering classes during Spring 2011, while living at SJSU International House, a dormitory for U.S. and international students. 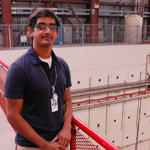 While he wished he could have continued on for an additional semester, his brief taste of Silicon Valley solidified that that was where he wanted to be after graduation. Silicon Valley is where Gagnon is at today, after earning a mechanical engineering degree from ETS (École de technologie supérieure) in Montreal. 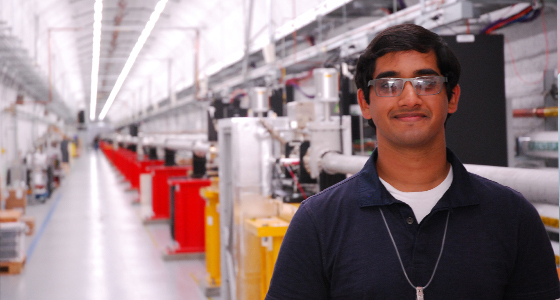 In May, he started a new job as a mechanical engineer in Tesla’s Closures Design group, which works on doors, hoods and trunks. Whether it’s the front trunk of the recent Model S or the “falcon wing” doors of the upcoming Model X, Gagnon and his diverse team are problem solvers who try to make cool features work as smoothly as possible. After his time at SJSU, he is grateful for the opportunity to follow his dream.